The largest mangrove forest in the world is in Bangladesh. Fortunately, the second largest is a little easier to get to — and it’s loaded with fish. I’m not sure what powers of reasoning fish have, but the hefty jack crevalle I am tethered to is a damn smart one. While it might just be cantankerous, there’s a good chance it got a glimpse of my gray hair and figures if it can make me circumnavigate the boat three times while forcing me to tightrope-walk on top of the gunwale, it stands a fair chance of me going splash and it going free. The jack dives under the boat five times, causing me to plunge the tip of my Okuma Shadow Stalker rod deep in the water to avoid tangling the line on the outboard or trolling motor. I am pretty sure at this point the fish is having more fun than I am. But eventually I get the 15-pound rogue jack close enough for Capt. Patrick Ewald to grab it by its forked tail and hand it to me for a few quick photos before I let it go. 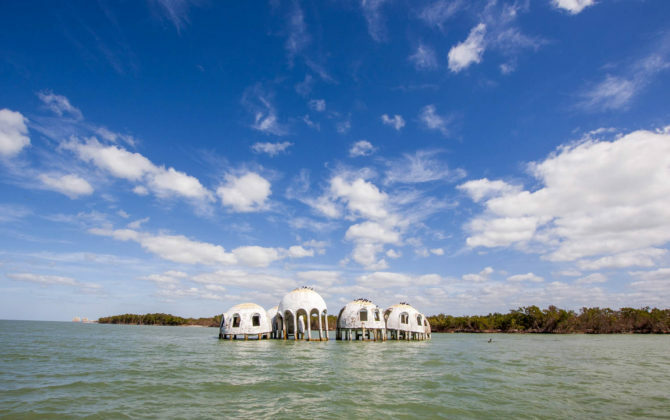 A geodesic house is slowly being reclaimed by Mother Nature. In the mangroves, the author found a jack crevalle to be a worthy adversary. Less than 24 hours earlier I was in an Embraer Amazon regional jet, staring out of the starboard-side window at a sea of grass topped by blue sky as the jet made its base turn onto final approach to Miami International Airport. 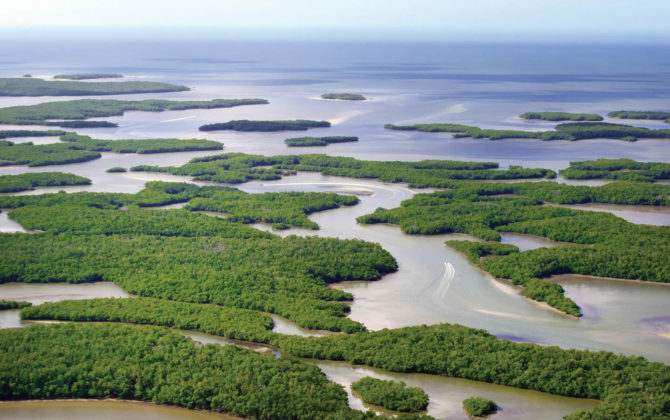 Between me and my destination — Marco Island, on the west coast — lay 100 miles of one of America’s greatest wildernesses: the Everglades. Although much mistreated over the past century, it’s still a source of mystery, history and wonder. Of course, it’s probably easier to fly into Ft. Myers and join the endless traffic pattern, mostly populated by drivers who maddeningly like to saunter along 10 mph below the speed limit, but for this trip, I’m going old school. Ostensibly, I am heading to a fishing event called Mangrove Madness, but in reality, I am coming home to a place I spent two of the greatest years of my life back in the early 1970s. The original approach to Marco is a two-lane ribbon of highway called the Tamiami Trail, built in 1915 to link Tampa and Miami and to foster development of that pesky River of Grass that clearly needed to be drained and turned into usable land. Surprisingly, traffic is pretty light, with most drivers favoring the more homogeneous four lanes of the Interstate 75 extension just to the north. But they are missing the run between Big Cypress National Preserve and the northern border of the ’Glades, which cruises through Miccosukee tribal lands, home to a dozen or so airboat ride concessions, “authentic” fake tribal villages and the ever-present gathering of buzzards noshing on a traffic-illiterate raccoon. 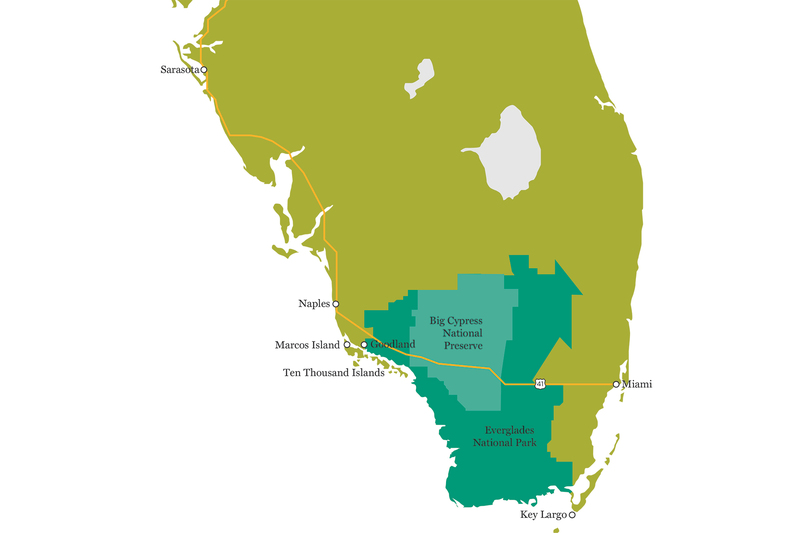 Big Cypress made the news recently when the U.S. National Park Service authorized wholesale oil exploration in our nation’s first “Preserve,” which will allow 1,100 miles of roads to be built in an area half the size of the Everglades’ 1.5 million acres. I hang a left off of Highway 41, as the Tamiami Trail is also called (quick, cue the song “Ramblin’ Man” by the Allman Brothers), onto a stretch called Goodland Road, and the memories start their playback. The huge S.S. Jolley Bridge had been built two years before my family moved to Marco from Wisconsin, which made it a much shorter drive to Naples, where I went to high school. Despite that, I usually came and went via the Goodland Road backdoor, which was flanked by mangrove-lined creeks and canals on either side and radiated pure Southwest Florida. Interestingly, the organizers of Mangrove Madness had booked us into the first place my family ever stayed when we used to vacation here. Founded in 1893 by “Wild” Bill Collier, it was the only hotel on the island for many decades and was actually listed in the Guinness Book of Records for the strangest reason: It had the world’s only two-story outhouse. I didn’t want to delve into the details of that accomplishment. At the get-together dinner that night, some 20 marine journalists gather to meet their captains for the coming week and be royally swagged by the sponsors of the event — a treasure trove of high-quality Yo-Zuri and Savage lures, Cuda tools, and logo-clad apparel from Navico, Okuma, Raymarine and FLIR, all of which we will use on our three-day mangrove assault. 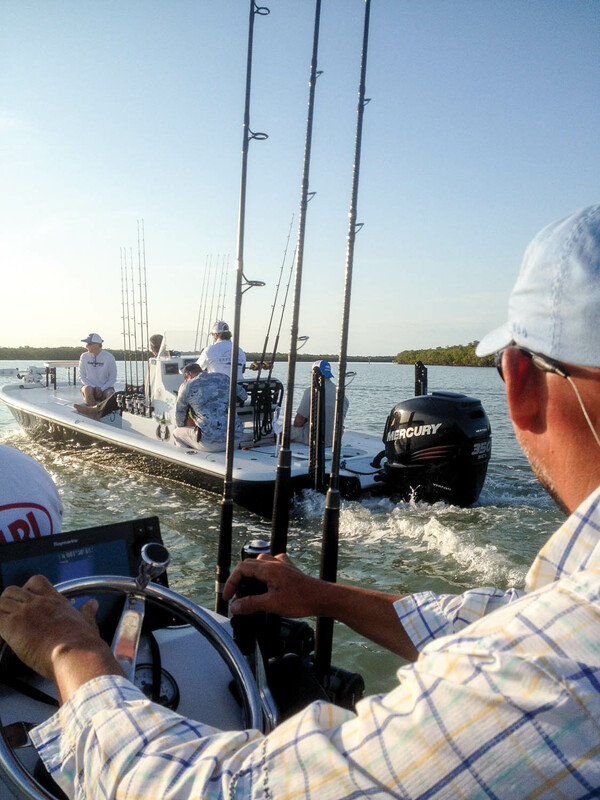 The next morning at dusk, we launch boats at the Calusa Island Marina in nearby Goodland. Some things never change, and soon we’re all swatting and scratching, thanks to the cloud of no-see-ums that have been making residents’ lives miserable for thousands of years. Rookie mistake on my part not bringing a Thermacell, which uses a small butane flame to cook a blue wafer whose active ingredient is derived from chrysanthemums and is incredibly effective against mosquitoes and I-can’t-see-ums-but-I-sure-can-feel-ums. Right off the bat we see one big problem: the water is muddy. But not from agricultural runoff issues just 50 miles to the north in Ft. Myers and on the east coast where the Okeechobee Waterway ditch has been flushed from the Big O due to high water levels. This is just the aftermath of a big blow that roiled the water, so our first order of business is to look for cleaner water, because most of the predators we are seeking, such as snook, trout and tarpon, are primarily sight feeders. Although we are primarily using lures from Yo-Zuri and Savage Gear, finding live bait to use as a control to compare the effectiveness of our artificial offerings is the first order of business, so Capt. Ewald points his Lake & Bay 24 Back Water offshore and hits the throttle on his Mercury 250 OptiMax Pro XS 250. 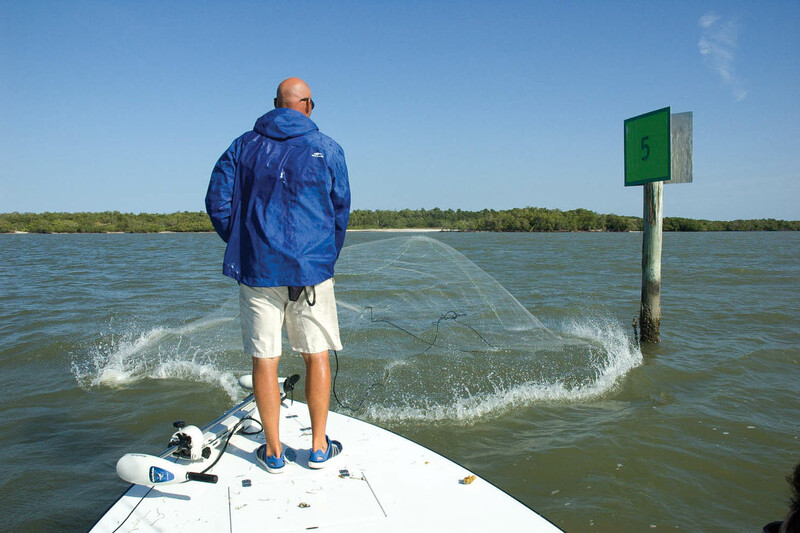 He tosses the cast net close to a channel marker but no one is home, so he does an about face and takes us into the heart of the Ten Thousand Islands. 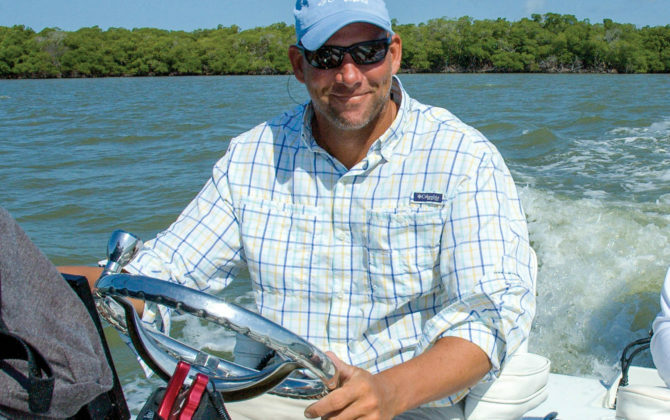 Ewald, of Caloosa Charters, is a veteran of mangrove fishing, but his primary fishing grounds are farther north in the Pine Island/Boca Grande area. We find a place Ewald declares to be “fishy,” and Chris Bishop and I start firing Yo-Zuri Crystal Minnows as close to the mangroves as we can get and do a “walk-the-dog” retrieve. The fourth crewmember is Vatche Arabian, the social media marketing manager from FLIR, who is along to document any fishing mistakes on our part that could go viral. Quickly, we get into some large jack crevalle, one of the hardest-pulling, most underrated gamefish. Bishop hooks the first one, and then I get a huge topwater blowup and hook my aforementioned “smart” fish, which puts me through its repertoire of advanced non-cooperation. Buddy from Yo-Zuri releases a hefty snook after a battle. We start working a shoreline that the tide is hitting perfectly, and Bishop nails a nice snook, which is the real prize down here. We are practicing catch and release on this trip, but snook season has just closed anyway. 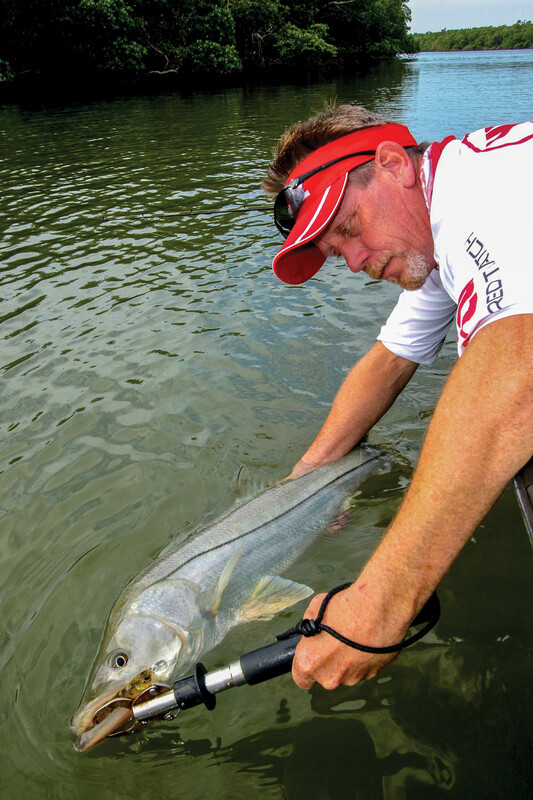 Neither catch-and-release nor a set season was practiced when I lived down here in the early 1970s, and anglers can take the blame for hammering the snook population, especially during breeding season when they would gather off beaches and in the passes. During those times, we would stack 20-pounders on the dock like cordwood, which sounds incredibly stupid now. Wiser management practices have brought the population back to what it was in pre-massacre days. In a few minutes, a huge redfish attacks but manages to evade the hook. We catch some chunky trout and the action remains steady, despite the roiled water. Ewald has been keeping his eyes open for tarpon, which is one of his specialties, but today we are in a state of tarponlessness, so after a full day of action, we head back. At our condo-like suites at the Olde Marco Inn, we grab a quick shower and have another surprisingly good banquet-style meal. After dinner, most of us take a short walk to the Snook Inn, a happenin’ tiki bar with two happy hours Monday through Friday; the second starts at 10 p.m., to keep the party going after the live music is done. I prefer its original name: the Snook Hole, so named for the large population of snook that still hang out at the end of the docks in the green underwater lights. As soon as we clear the no-wake zone coming out of Goodland the next morning, Capt. Geoff Page announces, “Hang on, we’re going on Mr. Toad’s Wild Ride,” a reference to one of the first Disney rides. He isn’t kidding. Page hammers the throttle on his Yamaha V MAX SHO 250, sending his Pathfinder 2300 HPS skipping along the surface at 55 mph as we head deep into the Everglades on our way to a spot just short of the Shark River’s mouth. Somewhere along the way, a dolphin is probably trying on my Boating World hat that blows off. 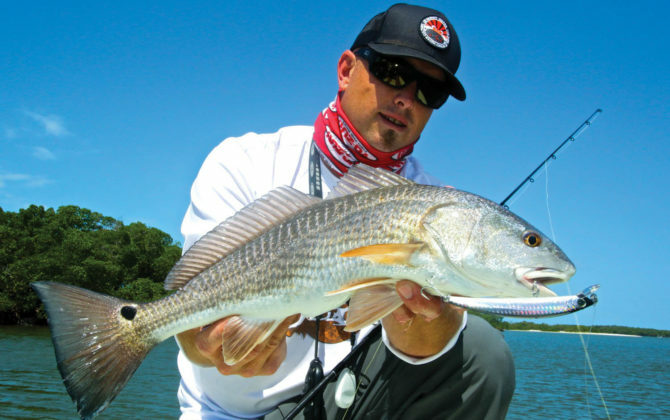 Long runs are nothing new for Page; he and fellow pro angler Rick Murphy teamed up in 2014 to win the IFA Redfish Tour Championship, running more than 100 miles one way to find the right fish. Our run today is about half that, and we find cleaner water and immediately get into a nice trout bite using Yo-Zuri Fingerlings and Savage Gear 3D Manic Shrimp. 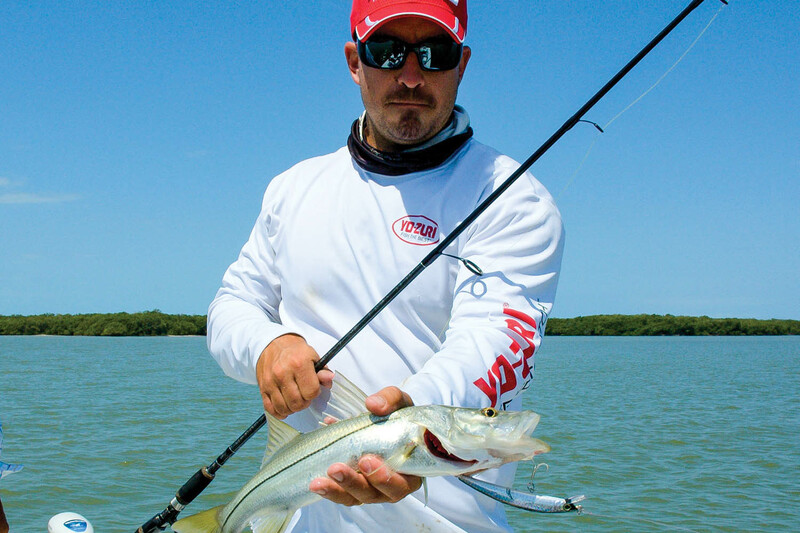 Chris Bishop from Yo-Zuri shows off one of many snook caught during Mangrove Madness. Page’s usual fishing grounds are around Sarasota, and he’s looking for good moving water, baitfish, birds, hard bottom or turtle grass. He rates local “intel” from other fishermen as the key, though, and has worked his sources. When the tide slows, Page heads offshore to a nearby reef where I see one of the strangest things I’ve ever seen. When we get to the reef, there’s a boat on it captained by Brian Sanders, one of the area’s top guides. 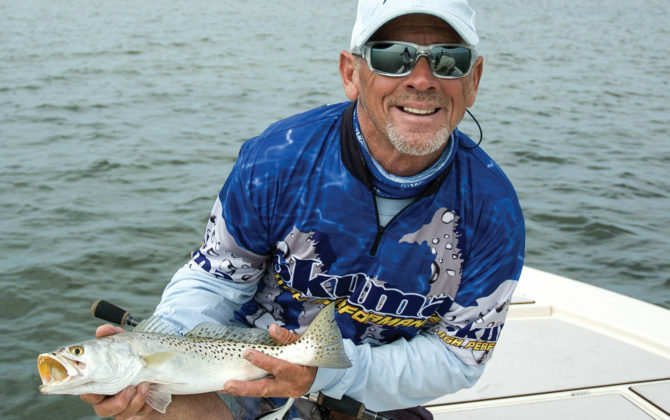 Page asks his permission to fish alongside, which is a courteous thing to do on smaller reefs, and we start catching — of all things — trout, which normally favor shallow, grassy flats. Sanders’ group lands a large pompano, which they are keeping for dinner. Doug Olander of Sport Fishing magazine, who is fishing with us, asks to take a photo of it. He has Sanders hold the fish over the water, at which point it suddenly squirms and escapes his grasp. Here’s the weird part: It swims on top of the water straight at Olander, who is 30 feet away. He reaches down, scoops it out of the water and returns it to a relieved Sanders. A strange ending to a great day. Aboard Ferrell’s Canyon Bay 2470, powered by a Suzuki 250 SS, we’re heading deep into the mangrove section of the Everglades. I notice on our Raymarine screen that we’re very close to the Chatham River, which is famous for being where “Bloody” Ed Watson began operating a sugar cane farm back in the late 1800s. His moniker came from the fact he is said to have killed more than 50 people, mostly workers who wanted to be paid. His exploits were chronicled in a masterful semi-fictional book by Peter Matthiessen, “Killing Mister Watson,” so named for his last day on earth, in 1910, when the residents of nearby Chokoloskee all opened fire, hitting him 33 times. I had camped at the Watson Place before and caught snook not far from here, so when we turned into the mouth of the Chatham, my heart rate shot upward. Down here, you never know what you are going to catch, and Alex Mei of Tackle Tour catches the largest lookdown, or moonfish, I’ve ever seen. It’s a curiously thin fish with a sloped forehead and beautiful pearlescent coloration. Then we head back into a small bay and start catching trout. There are numerous oyster bars here, so we expect to catch a redfish at any moment, but they are not to be found. Gardner wants to get some drone footage, so we drop him off on an oyster bar and keep fishing. Ferrell waits until the drone is in a perfect spot and chooses that time to hook and land our first snook of the day. What a professional! We have several other shots at snook holding tight to the bank, but they aren’t in a feeding mood. Toward the end of the day, we start working our way back to Marco Island, which is the northernmost of the Ten Thousand Islands. Ferrell had noticed a long line of crab traps just offshore earlier in the week, and I know what he has in mind: tripletail, a weirdly prehistoric fish that’s among the best eating fish in Florida. They tend to hang on the surface right by the buoy, so we begin following the string of traps, while on plane, and it isn’t long before we spot the telltale flash of brown. 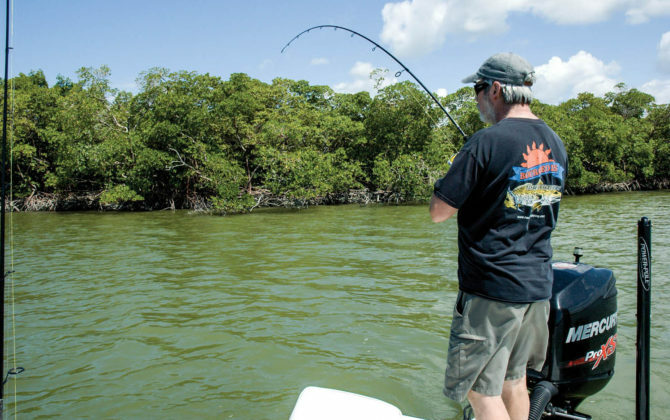 I fire a pink jig, tipped with a shrimp just up-current and after a surprisingly tough battle, I hoist the four-pound fish aboard for photos, which is a great way to end our mangrove adventure. 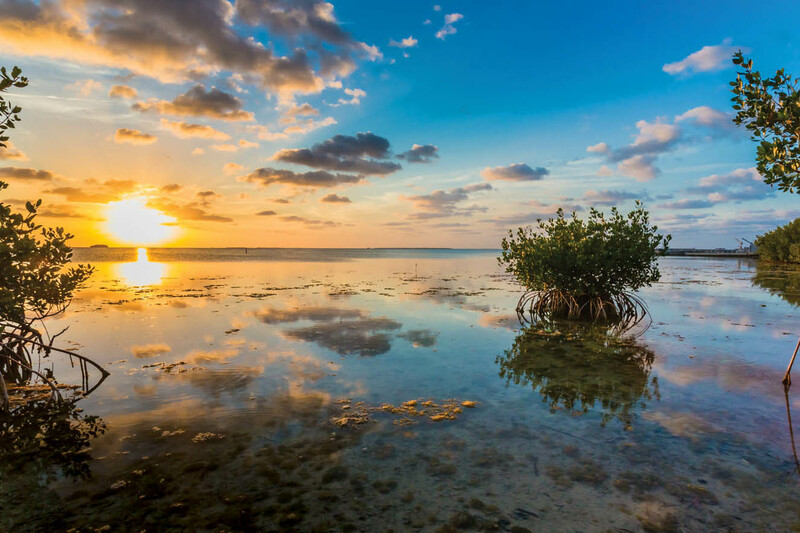 Marco Island has changed from a small village on a large mangrove island to a fully developed community with a skyline resembling Ft. Lauderdale, but the mangroves that stretch from here to the Keys are still as wild and as fishy as Florida gets, and it’s the perfect winter getaway for anyone with a boat on a trailer.